Mutual reception is not included in the calculations for dignity or debility. 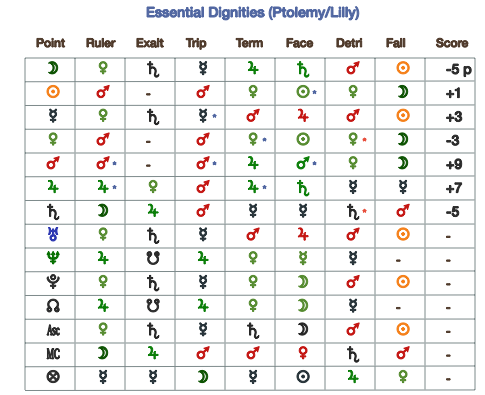 You may notice a difference between the triplicity values in the Essential Dignities table shown by Solar Fire, Astro Gold and AstroConnexions. There are three settings available according to the SF help. • Dorothean – According to Dorotheus of Sidon. The default setting for SF is for Ptolemy. The setting used by AC is Ptolemy as defined by Lilly. The major difference is that Lilly gives Mars to the water signs. The Ptolemy setting used by SF does not.